In keeping with tradition (see my previous posts on Bath Abbey and York Minster), this year we visited Ely Cathedral. Ely is a small city in the heart of the fens in the east of England. The cathedral sits at the heart of the city of Ely, which grew up around it. Amongst other things, on our visit there I was struck by the recognition afforded women. Ely Cathedral sits on the site of what was once an abbey founded by Etheldreda* in 673. Etheldreda was a woman, a Saxon princess and queen, an abbess, now St Etheldreda. The abbey she founded was for both men and women, a double house. Etheldreda, has a somewhat unusual history. As a princess, daughter of the king of East Anglia, she took a vow of celibacy, which she expected her later husbands (to whom she was perhaps married for political reasons) to respect. Her second husband, then king of Northumbria, tired of this stance and, when he failed to persuade (or bribe) bishop Wilfrid to speak to her for him and attempted to take her by force, Etheldreda fled to her land in Ely for safety, where she later founded her abbey. The abbey flourished for 200 years until destroyed by Viking invaders, and was later re-established as Benedictine monastery. Etheldreda died of a tumour. 17 years after her death her body was disinterred and found to have suffered no decay, and her tumour to have healed. A shrine to St. Etheldreda drew pilgrims to the monastery. Today, at the east end of the cathedral there is St Etheldreda’s chapel and a statue, by sculptor Philip Turner, of the saint. There is a plaque in the floor of the cathedral marking the spot where it is believed the shrine to Ethelfreda was once situated. Each year St Etheldreda’s feast days on 23 June and 17 October are celebrated in the cathedral with the singing of The Ely Sequence, which tells her story. Many cathedrals have a lady chapel dedicated to Mary, the mother of Jesus. Ely is no exception, and in fact has a beautiful free-standing, and by far the largest, lady chapel (dating to 1321), with a recent extension at the east side of the north transept linking it with the main cathedral. 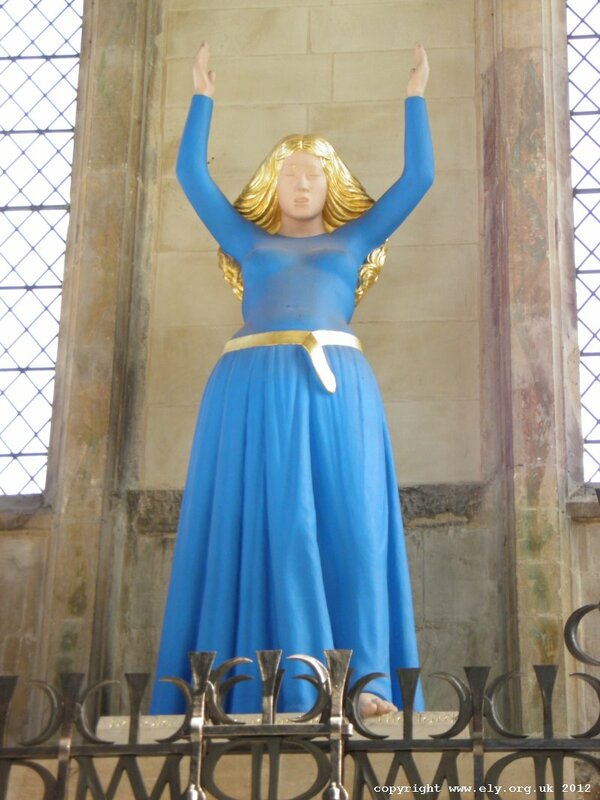 At the front of the chapel is a large sculpture, by artist David Wynne, of Mary. This is not the traditional demure statue of Mary with head bowed bowed and hands together, passive, but rather the Mary of the Magnificat arms raised praising God, and became the subject of some controversy between those who loved it because in this statue Mary is not passive, and those who hated it. 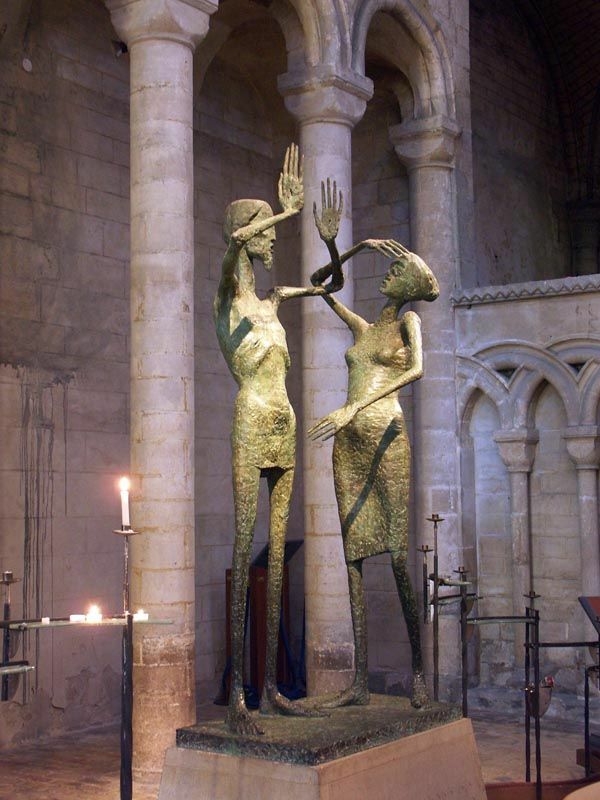 In the south transept of the cathedral is a modern sculpture, also by David Wynne, of the events described in John 20:11-17, depicting the encounter of Mary Magdalene with Jesus following His resurrection. Ely seems to favour sculpture, and one further piece which touched me, a work representing a journey from darkness to light, is the sculpture by Jonathan Clark, hanging on the wall of the north-west transept by the entrance to the cathedral, titled The Way of Life. Finally, in contrast to the places of worship featured in my earlier posts, whilst the cathedral in Ely is a popular place for tourists to visit as well as a place of worship, I was impressed that during the more than 4 hours we spent in the cathedral, every hour on the hour the duty chaplain would invite all present to be seated and to participate in a few moments of prayer, each time culminating in the Lord’s Prayer by all who wished to participate. Do you feel there is sufficient representation of women in the art work found in LDS places of worship? In what ways could the part played by women in our history be recognised? *There are other variants of the name (Æthelthryth, Ediltrudis, Audrey), but Etheldreda is the name used in the cathedral. Interesting commentary on the statue of Mary can be found here, and on the statue of Mary and other works of art in the cathedral here. If the artwork reflects LDS philosophy and attitudes toward women, then “no.” And it’s important to consider not just the quantity but quality of representation. Interesting sculpture of Mary. Where is her Baby? Maybe 21st century Mary can stand on her own, with arms raised in the air like her Son. I find Ely to be the most mysterious of all England’s Cathedrals. It’s really like entering another world, particularly the chantry chapels decked out in such gaudy gothic. Kat, I’d agree with you that quality is important. Nate, my understanding is that this is possibly Mary whilst pregnant, leastways that’s where the Magnificat comes in, when she meets Elizabeth. I don’t know if you looked at the links in the notes at the bottom of the post, but the author in the final link makes some connection with the posture, to that found in early Christian art, and she gives some examples. I think you have to blame the Victorians for the gaudy gothic. Ely underwent a great deal of restoration during the Victorian era, including the stained glass windows, and the painted ceiling. Of course, as we told on our tours of many of these religious buildings, they weren’t intended to be bare stone in the beginning. That dates to the reformation when the paintings were scrubbed from the walls, ridding them of ‘popish idolatry’. That strikes me as overzealous on the part of the reformers; in an age when few could read, the images on the walls and in the glass told the stories of the faith. There are, as is pointed out by the guides, still traces of the original paint in the arches particularly. A pregnant Mary, that makes a bit more sense. I know the Magnificat is a central canticle in the Anglican service, but this is the first time I’ve seen a sculpture of Mary in Magnificat mode. Usually it’s an annunciation, a nativity, or a pieta. I love the idea of celebrating the pregnant Mary. I love the Victorian additions in Ely, especially the wonderful painted ceiling. Thanks for this. A reminder of how big our world really is. Lovely photos Nate. I’m glad you linked that. I love the sculpture of Mary! Thanks for this post, Hedgehog.